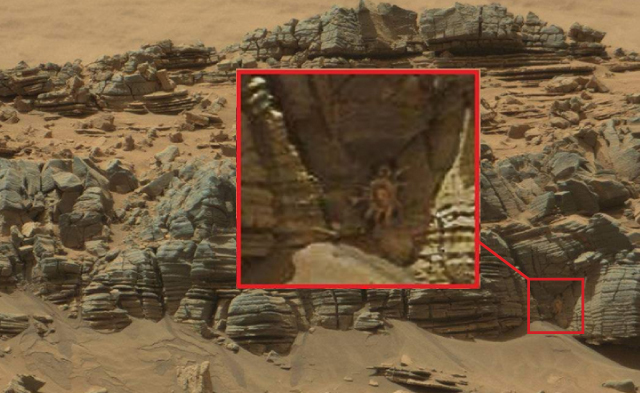 NASA released this photo of a “mystery object” on Mars spotted a few days ago. No official word on what it may be, but clearly resembles the FSM. Thanks for giving the references. Yes, give me all of them. I find that Thumpers never read the Bible they just thump. I Once told one that the 6 million Jews that Hitler murdered will all go to hell because they did not worship Jesus. On the other hand, if Hitler accepted Jesus on his death-bed, he could go to heaven by express! He denied it. He said nobody goes to heaven by Expess. I told him to take out his Bible and turn to Luke 23. One of the Criminals being crucified with Jesus admitted that he deserved to be executed but he called to Jesus “remember me”. Jesus answered: “today you will be with me in Paradise”! That’s what I call “going by express”. Even Jesus had to wait 3 days to go to heaven! I’m thinking of putting out a version of the Bible called “The Bible that the cherry-pickers overlooked! I’m sure it would be a best-seller with the Muslims at least! Lots of atheistic stuff on YouTube, revealing stuff in the Buybull which nobody mentions because it’s bizarre, evil and irrational. Excelsior…. I’m sure that a Cherry Picker’s Bible is desired by each new fundamentalist group. Perhaps that’s why there are so-called Authorised Versions? However, an electronic version that links all of the contradictory quotes would be wonderful: look up one thing, and, the contradictions are also provided. I suspect that the bizzare, evil and irrational stuff is still selected by wacky groups because it serves their desire to be unique, hateful and persecuted. I had to send this link along. A great electronic map of bible contradictions. Thanks for that Murphilly. I’m not used to seeing these comparisons in terms of graphs. Usually I just see lists. you know I am a peaceful person who rarely is rarely angered but seeing someone who does not recognize his Noodliness on sight makes me very upset. I recommend acquainting yourself with more pictures of the FSM so this does not happen again. Dear Sara, it’s a disciple of the FSM, seeking life forms to convert. Or beer. What else could it be? oi feg wat is ur problem feggit why u tink dis is acceptable feglord??? Will this church offer me forgiveness for the terrible things I did to that child? If so, where can I sign up? No! But, we’ll drink your beer if you’re paying. Dear matt, welcome back. I agree, it’s definately The Flying Spaghetti Monster. A footloose and fancy free god, it buggers around all over the place. Long Live FSM, our beloved planet-hopping critter. He created everything, obviously, He is the creator. And He must get tired of stupid people sometimes, or He was just drunk and needed a place to go, so why not take a vacation to Mars. It’s sad though that he can’t get alone time, even when on another planet. The “scientists” are too busy being stupid. We were meant to be on Earth, sailing the seas and spreading joy, pasta, and beer (and the occasional candy for children), not exploring Mars with our technologies.